Through New Year's Eve, chef/owner Matt Lake offers unique dinner specials geared for the holiday season at Alamexo (268 S. State, Salt Lake City, 801-779-4747, Alamexo.com). 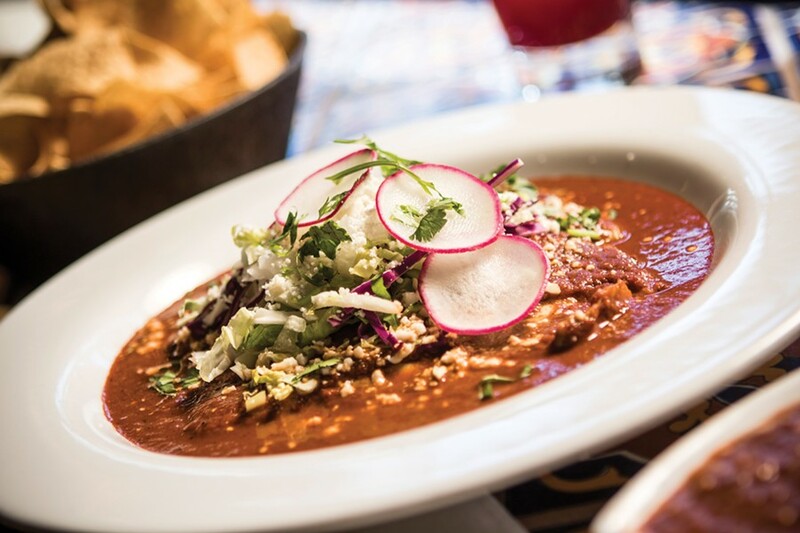 Special à la carte offerings include chile rellenos en nogada con borrego, which is two roasted poblano chilies filled with lamb picadillo, baked in a goat-cheese and walnut sauce and topped with fresh pomegranate seeds and cilantro. Also on the limited-time menu is pescado tikin-xic: an entrée of wild mahi filet marinated in achiote and citrus, wrapped and grilled in a banana leaf and served with sweet plantains and habanero vegetable escabeche. Also, the new Alamexo Cantina in SLC's 9th & 9th neighborhood is scheduled to open in March 2017. Yet another new distillery heads our way in 2017: Park City-based Alpine Distilling (AlpineDistilling.com) pays homage to European liqueurs with products blended from natural flavors and botanicals with premium-grain neutral spirits. Its first two concoctions hit the shelves this January, and both have already earned medals in the international consumer tasting 2016 SIP Awards. The release of the black tea-, fruit- and spice-inspired Preserve Liqueur is accompanied by aromatic Stone Fruit-Primrose Bourbon Whiskey. Sounds intriguing, right? Managing Director Robert Sergent says, "Being recognized pre-launch with such high honors is very rewarding. We look forward to making them available to the public shortly." Portions of proceeds from the products benefit nonprofits such as the Park City Community Foundation and Swaner Nature Preserve. Spice Kitchen Incubator (SpiceKitchenIncubator.org)—which trains and assists new immigrants and refugees in creating their own food businesses—has added another success story to their ever-growing list of achievements. Chef Kaltum of Mother of All (purveyor of delicious Sudanese food) recently pulled up to the Spice Kitchen, grinning ear-to-ear, in what is now her very own food truck—and the first to be owned by a Spice entrepreneur. Congrats to all! Quote of the week: "He was a bold man that first ate an oyster."